Roy Keane has had "an informal chat" with Celtic's majority shareholder, Dermot Desmond, about becoming the Scottish champions' new manager. 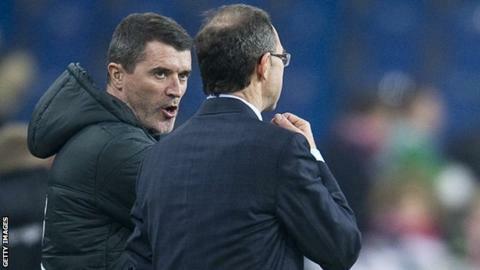 The meeting was revealed by Republic of Ireland manager Martin O'Neill, to whom Keane is presently assistant. But Celtic have responded by saying they are are continuing to talk with "a number of excellent candidates". "He has had a number of offers from other clubs as well and he's obviously a lot to consider," said O'Neill. "He was coming right back into high-profile again and perhaps I didn't expect it to happen so quickly." It was Desmond who had brokered the deal that led to the former 42-year-old former Sunderland and Ipswich Town boss becoming O'Neill's assistant in November. Now former Manchester United midfielder Keane, who finished his playing career with Celtic, has become a strong favourite with the bookmakers to take over in Glasgow after the resignation of Neil Lennon. Keane was due to address a media conference in London on Thursday ahead of this weekend's friendly against Italy at Fulham's Craven Cottage. O'Neill arrived instead, asking reporters if they were "surprised" to see him. Asked about Keane's future, the former Celtic manager said: "I had a call the other day from Dermot Desmond asking to speak to Roy if it was at all possible. "I mentioned it to Roy, of course, and I'm sure he was wanting to have a chat anyway because managing a club like Celtic might not come around too often. "It was just a really informal chat I think. I would be really disappointed, of course, if Roy was to leave us. "But I kind of felt that, when I took him on in the first place, that, over the course of the next 18 months to two years, this thing is likely to happen." Among those also linked with the Celtic job are several of their former playing staff - David Moyes, recently sacked by Manchester United, Henrik Larsson, presently head coach with Falkenberg, and Malky Mackay, who was dismissed by Cardiff City. Owen Coyle, who was most recently in charge at Wigan Athletic, is a lifelong Celtic fan who is also thought to be in the running. O'Neill could not say whether Celtic had indicated to Keane that they were talking to other candidates but said his colleague had much to consider. In particular, the former Parkhead boss thought that it would be a challenge to take over a club with such a short a summer break before being faced with Champions League qualifiers. "I would certainly expect him to be here for Saturday," said O'Neill. "I think that's what he wants to do. "I think we'll take it step by step at the moment. Things can develop very quickly, or slowly. "Coming into this job has rekindled interest in him. We'll all be disappointed - players, backroom staff and myself - if he goes." Celtic quickly moved to play down reports that Keane had already been given the job. "Following speculation concerning the manager's position at Celtic, the club can confirm that it is currently continuing its discussions with a number of excellent candidates," said a website statement. "We will continue this process and select who we regard as the best appointment for Celtic. We will update our supporters as soon as this process is complete."